Colour vision isn’t the same for everyone. In fact, some people may have a deficiency in their vision that prevents them from making distinctions between colours within the spectrum. Red-green colour blindness affects approximately 8% of Northern European men, but only 0.5% of women with the same ancestry. So why is it that this visual deficiency occurs among males so much more frequently? While colour blindness could be a result of disease, trauma, or drug toxicity, it’s most commonly a result of genetics. The mutation for colour blindness is carried on the X chromosome. Females have two X chromosomes, so if they have one that is unaffected, they will only be carriers. 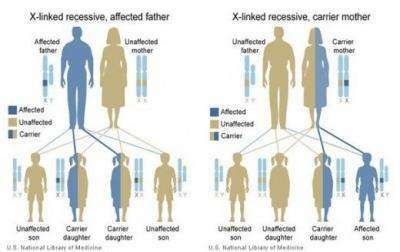 To be at risk of inheriting the disorder, females would need both a carrier mother and an affected father. Conversely, males only have one X chromosome that is inherited from the mother’s side. If that chromosome is affected, the male child will be colour blind. Complications of this hereditary condition may become more apparent as those afflicted grow older—for instance, their colour blindness may impact their choice of occupation or performance in certain tasks. There are three main types: red-green, blue-yellow, and complete. Each form is characterized by different deficiencies and underlying conditions. While the red-green defect afflicts males more than females, blue-yellow colour blindness affects both sexes equally. Deuteranopia: reds appear brownish-yellow, and greens appear beige. Deuteranomaly: yellow and green appear redder, and it’s hard to distinguish between purple and blue. Protanopia: red appears black, and certain shades of orange, yellow, and green all appear yellow. Protanomaly: red, orange, and yellow appear greener, and colours aren’t as bright. Tritanopia: blue appears green, and yellow appears purple or light grey. Tritanomaly: blue appears greener, and it’s hard to distinguish between red and pink. Cone monochromacy: occurs when two of the three cone cell photopigments (red, green, or blue) don’t work. People affected will only see in black, white, and grey. Those with blue cone monochromacy may also have near-sightedness or reduced visual acuity. white, and grey, and tend to be uncomfortable in bright environments. Pseudoisochromatic colour test: the most common test to identify red-green colour blindness. You’ll be asked to read a number on a plate of dots in various colours and sizes. Cambridge Colour Test: similar to pseudoisochromatic colour tests, you will look for a “C” shape on a computer screen and be asked to identify which quadrant it appears in. Anomaloscope: you will be asked to look through an eyepiece where you will see two different colours. You will use two knobs to adjust the colour and the brightness of the lower half until it matches the top. If you are entering certain professions, such as the police service or the military, you may undergo more precise testing to determine the proficiency of your colour vision. Researchers are working to develop a cure to this visual deficiency. In fact, they have actually developed a gene therapy to cure colour blindness in adult monkeys. This innovation brings hope that one day there will be a way to cure humans of the disorder, as well. Until then, new advancements in spectacle and contact lenses have given options to help individuals in certain situations in everyday life, sports, and occupations. 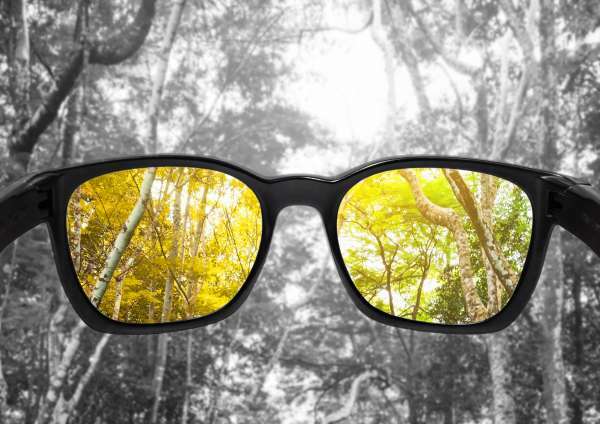 To learn more about how colour blindness is being corrected, check out this blog.